As I promised, you’ll meet the queen of Hungarian soups here. I would like to show you a recipe which is the basis of the main meal, medicine of illnesses, and essential tool of every housewife. I can guarantee if you learn how to cook the Hungarian meat soup, you will twist your husband or boyfriend round your little finger. Believe me, I’m a real man and I know what I’m talking about. But, if you are a man and you want to enthrall your wife or girlfriend. I highly recommend you also try out this soup. You will be surprised about the result. 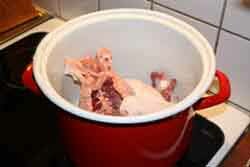 Here I share with you the biggest secret of the Hungarian meat soup: you have to cook this soup on the lowest grade of your stove for a long time. The good thing about this magnificent Hungarian food is that you don’t need to stay at the fireplace until the soup is ready, it simmers by itself. You have enough time to do something else e.g. watch a DVD movie or whatever you want. It is great news, isn’t it? What ingredients should you buy? You can use any other meats and bones as well, you don’t need to be strict with them, and the main thing is here to have different types of meats cooked together. 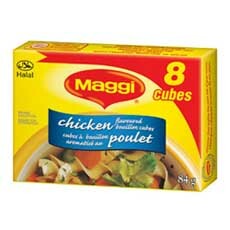 Very important ingredients: 2 pcs of Maggi soup cube – this gives the Hungarian Meat soup a superior taste! One more important thing, you need to have a very big pot! Please take it seriously. The more you cook, the better the taste. It is very important to clean everything carefully before you put it into the pot! You have to wash the meats and peel the vegetables. 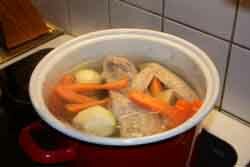 You will have to take some of the vegetables out of the soup early, because otherwise they will be boiled to rags and give the soup too strong of a taste. This is e.g. the kohlrabi.The main point is after you have cleaned everything to fill up your super big pot with lots of cold water and put the meats in it. Don’t be surprised! There will be foam on the top of the soup. This is totally OK, what you have to do is remove it with a spoon or strainer. You can repeat this until the soup is “water clear”. After you removed the foam, you can put the vegetables. 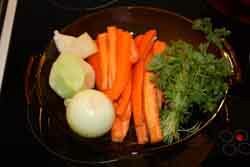 At this point, the vitamins can come out of the vegetables, because the fat of the meat has started to cook out. You can also put some cumin and/or salt in now. If you end up not having room for everything in the pot, don’t give up! You can fill up the remaining empty spaces with carrots. And finally you can go and watch a movie or two. 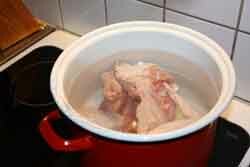 The Hungarian meat soup can be easily cooked for 3 hours until all the meats are soft enough. But, don’t forget it on the stove! Sometimes you should taste it and possibly add more salt. Also, be careful with the onion, if you see that it starts to collapse, just take it away and drop it into the rubbish. This way you can avoid having small onion pieces swimming in your soup. Don’t forget to cook the soup all the time on a low temperature (lowest grade of your stove), with a lid on, and never stir it! This is extremely IMPORTANT, because if you forget this your soup will be muddy! After everything is soft, you can carefully take away the vegetables and the meats. 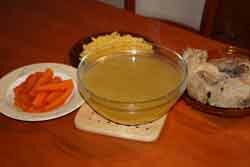 Let the soup subside and decant it into a fire resistant glass dish. 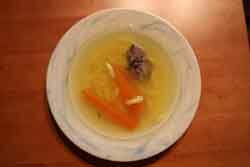 It is quite important to decant the soup as there might be some small pieces of bones in it. I recommend to you use this glass dish just to show your loved one the beautiful gold color of the original Hungarian Meat Soup! If you want to decorate the soup a bit, you can put some parsley on it. 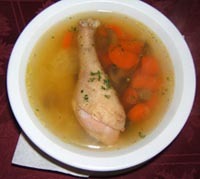 Put the meat and vegetables in a separate dish, and serve them alongside your Hungarian meat soup. Finally, don’t forget the pasta! You should cook some pasta separately. The best is to use vermicelli (this is a very thin pasta) if you cannot have this special pasta you can use whatever type you want, except spaghetti. The above quantities are just a reference, you should experience the right amounts. Sorry about this, but it is very difficult to say exactly how much salt and pepper you need. It really depends on you. Separate the egg white and yolk. Whip the egg white well and put the yolk and other ingredients into it. Mix them up and let them sit for 10 minutes. 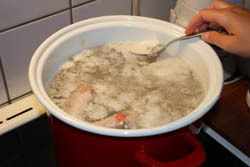 Gently drop the semolina balls into the filtered and boiling Hungarian meat soup. Make sure the soup isn’t boiling too hard, because if the soup is boiling heavily your semolina balls will be moldered. Or you can cook them just in boiling water, but you will lose some taste which could come from the soup.There you are, it was not so difficult, was it? Congratulations! I was sure that you’re a perfect cook! Enjoy your first Hungarian Meat Soup! I would be more than happy if you could share with me how you were able to accomplish this traditional soup. Don’t hesitate to write me your story via our contact us page. Healthy Eating Made Fun Experiment with healthy recipes and exercise routines and discover how looking and feeling your best can really be made FUN. Take the 'Drab' out of losing, gaining or maintaining weight but instead enjoy your journey to a healthier, happier you.